Union says they'd prefer MATA focus on bus overcrowding and maintenance issues instead of purchasing new trolleys. Using the hashtag #transitNOTtrolleys, the Memphis Bus Riders Union (MBRU) has taken to social media with a call for the Memphis Area Transit Authority (MATA) to focus on improving or replacing buses rather than spending money on replacing trolleys. 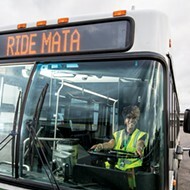 In July, MATA approved the purchase of eight rubber-wheeled, trolley-like buses for $1,178,256. But Bennett Foster, an organizer with MBRU, said the focus should be on remedying recent complaints of overcrowding and a lack of air conditioning on buses, as well as buses breaking down in the middle of routes. 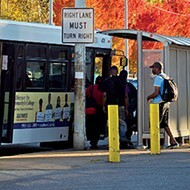 MBRU organizers recently met with Mayor A C Wharton regarding the transit system's budget, suggesting a prioritization of buses and bus facilities — both of which, the organization says, are lacking. 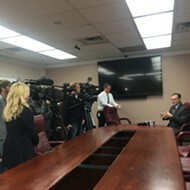 "We met with [MATA President] Ron Garrison a few months ago, and he told us there are just dozens of buses parked on his lot that are not operating, as well as buses that are beyond their useful life," Foster said. "Our campaign right now is centered around the funding that we're getting for trolley renovations and trolley infrastructure. It's inequitable." Alison Burton, marketing and service director for MATA, said there is an open dialogue with MBRU regarding transit issues. She said MATA executives shared mutual concerns over the poor state of the William Hudson Transit Center (previously the North End Terminal downtown), which is currently getting new paint and flooring. While the union is happy to see MATA making improvements there, the focus of their latest campaign is MATA's push for new trolleys, which union members say will take away money that could be used to fix other issues. In a fact sheet given to the mayor by the MBRU, the organization says more than two-thirds of the MATA's capital funding will go toward new trolleys, when they believe it should go to replacing buses. 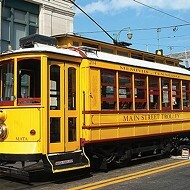 MATA admits that trolley ridership is way down, after the vintage trolley streetcars were temporarily replaced with trolley buses. 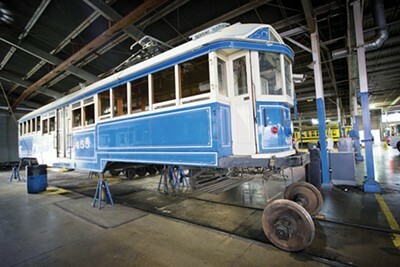 MATA is still working to get the original trolley cars back online after several trolley fires, but there is no timeline for when that will happen. In the meantime, MATA will use the new trolley-like buses on the routes. "We know trolley ridership is down 70 percent," Burton said. According to Burton, ridership is more than 35,000 per month on the bus "trolleys" downtown. But when the streetcars were up and running, ridership exceeded 125,000 riders per month. 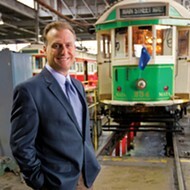 Ron Garrison, president and general manager of MATA, says the trolleys are a challenge. And he agrees that MATA's older buses should be replaced, but the budget is limited. He said MATA currently has 60 buses in use with mileage as high as 700,000. That's 200,000 miles past when they should be retired, according to the Federal Transit Authority. More than two dozen have over 600,000 miles. "This makes it very challenging to make the buses work as well as they could," Garrison said. "I have money to replace three buses this year." And as buses get older and more miles are put on them, he added, they are more expensive to repair. "We've reorganized our maintenance department," Garrison said. "I hired a new director of bus maintenance and a new assistant. The department is much better. We've found ways we can save money, which we put right back into maintaining buses, but there's only so much you can do with over 60 buses that are well past their useful life."